It’s not every day that a teenaged aspiring lawyer has a mentoring opportunity with a lawyer of 25 years experience. 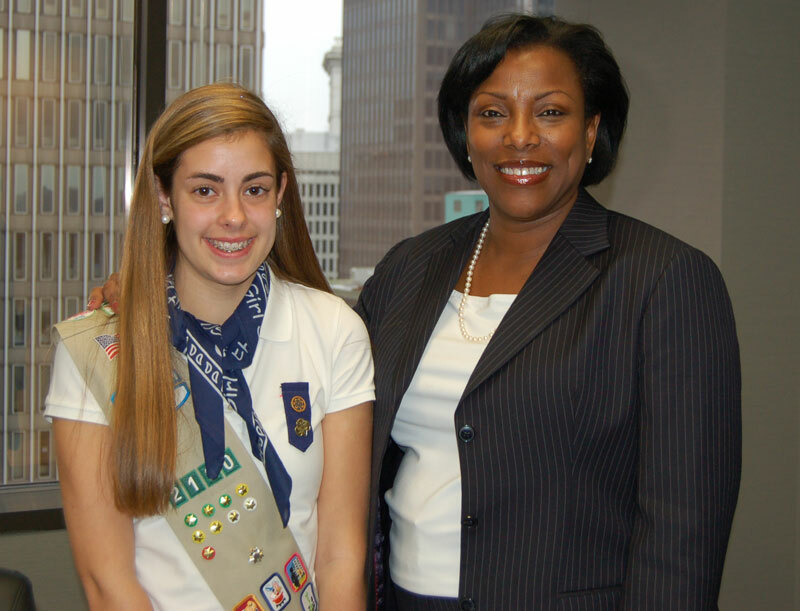 Through the Distinguished Women Shadow program, Girl Scout Chloe was able to spend a day with Ava Lias-Booker, Esq., Managing Partner of the McGuire Woods Baltimore Office. Chloe was able to go to court with Ms. Lias-Booker and get a glimpse of what really happens during a major case. Chloe said her experience gave her a glimpse of what court is really like outside of what is portrayed on TV shows. Ms. Lias-Booker said she was glad to have the opportunity to mentor Chloe because of how little exposure she had to what being a lawyer was like when she was growing up. “I think I decided to become a lawyer when I was right around Chloe’s age and I was in this really small school in Georgia…and we a mock trial exercise and I was one of the lawyers. That was the sole exposure I had to the process growing up,” she said. Ms. Lias-Booker added that it’s important for girls to find mentors in their fields of interest. “I think it’s absolutely critical that girls and young women to find mentors. The more role models you have to latch on to, the more real they are to you and the more you can talk to them, spend time, ask them questions, the more confidence you’ll have to go forward and do what you really want to do,” she said. Proceeds from the Distinguished Women’s Awards Reception support Girl Scout leadership programs like the Distinguished Women shadow days. Chloe and Ms. Lias-Booker will speak at the Distinguished Women’s Awards Reception on Thursday, April 26, at 5:30 pm at the Baltimore Country Club in Roland Park–click here to learn more or to buy tickets. For more information about the Distinguished Women program or to become a sponsor, contact Maria Darby at mjohnson@gscm.org.